We are a friendly gardening community group interested in promoting climate compatible gardening using plants from the five Mediterranean regions of the world. We are affiliated to the MGS and have close links with other gardening groups in SA, notably the South Australian Open Garden Scheme and the Garden History Society. We have a lively programme of meetings and visits and publish an electronic newsletter four times per year. 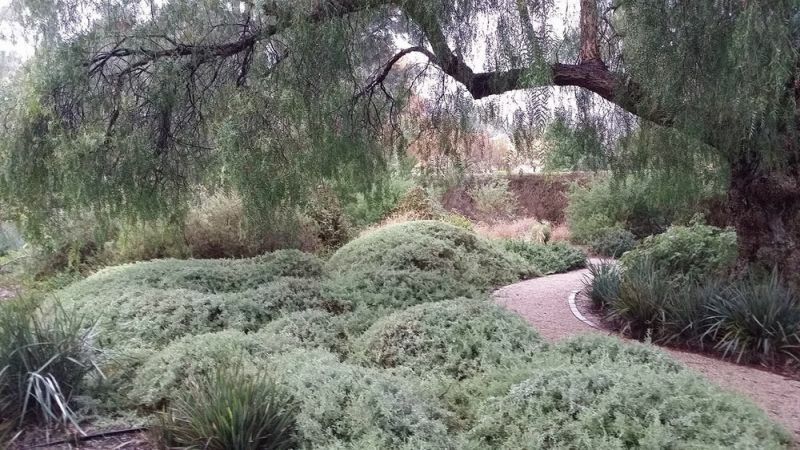 We support the Garden of Discovery at the Waite Historic Precinct of the University of Adelaide: having undertaken a major refurbishment of the garden, we continue to donate plants and hold working bees. Our Branch Head is Kate Chattaway. Please contact our membership liaison committee member, Jo Hoskins, if you are interested in joining the SA Branch of the Mediterranean Garden Society. For further information go to our website and follow us on Facebook. The photograph at the top of this page shows Rhodanthe manglesii blooming at The Daisy Patch at Coonalypyn, South Australia, where the garden is almost exclusively Australian Native plants which have been selected for their ability to survive on rainfall alone. Photograph Chris Kirby. For older reports and articles please check out the archived (non-responsive) South Australia Branch page. Our branch is responsible for a garden which forms part of the Waite historic precinct, owned by the University of Adelaide. Our branch undertook a major refurbishment of this Garden in 2009, donating many plants and committing to help maintain the garden through regular working bees. We stage working bees four times a year for members to help plant, plant, weed and prune the Australian natives which feature in this garden. Mark Barnett and Robyn Powell, both experienced horticulturists, and SAMGS committee members with a wealth of knowledge to impart. Mark is a garden designer of note with decades of experience designing climate compatible gardens and Robyn runs the specialist perennial Tupelo Grove Nursery in the Adelaide Hills. To be held at 19.30 in the Goodman Lecture Theatre. Elizabeth recently returned from a trip to Israel in order to attend the centenary commemoration if the famous WW1 Light Horse charge at Beersheba. She also visited the Greek Isles with the Australian garden writer, Trisha Dixon including Sparoza. In this talk held at the Adelaide Botanic Gardens she referenced many plants from the Mediterranean including the national flowers of Israel (anemone, formerly cyclamen), France (Iris), Italy (white Lilium), Jordan (Black Iris), Spain (Carnation) and Greece (Acanthus). Janelle was the worthy winner of the SA MGS SA’s second scholarship which enabled her to spend time working and gardening in the garden of Sparoza under the guidance of Sally Razelou. Janelle refers to her time in Sparoza as ‘life changing’ which is indeed wonderful to hear. The scholarship was made possible through the SA MGS Branch and generous sponsors, James Hayter, Director of Oxigen Architecture and Landscape Design and several contributing members of the MGS SA Branch.